Here is my third week of #100happydays. Enjoy! Day 15 – July 21, 2014: Today we spent the evening working on our super secrete awesome project. 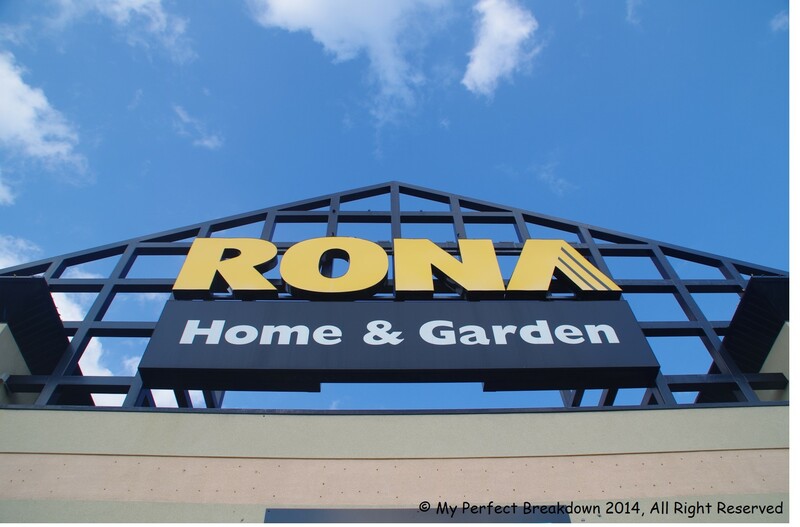 And, what would an evening of work be, without a trip to Rona. A trip to Rona, means we are one step closer to being finished. Yay, us!! Day 16 – July 22, 2014: This evening, once my husband was done working for the day, we went out for an evening in the city. Here is my favourite photo of the evening. It was beautiful night, filled with laughter and smiles. Day 17 – July 23, 2014: Today included a drive to pick up another piece for our super secrete awesome project. My husband and all my friends were working during the day, so I ventured out on my own for the 4.5 hour round trip. To break up the driving, I stopped along the way to get a few photos of the beautiful prairie landscape. Simply put, we are so blessed to live in this part of the world. 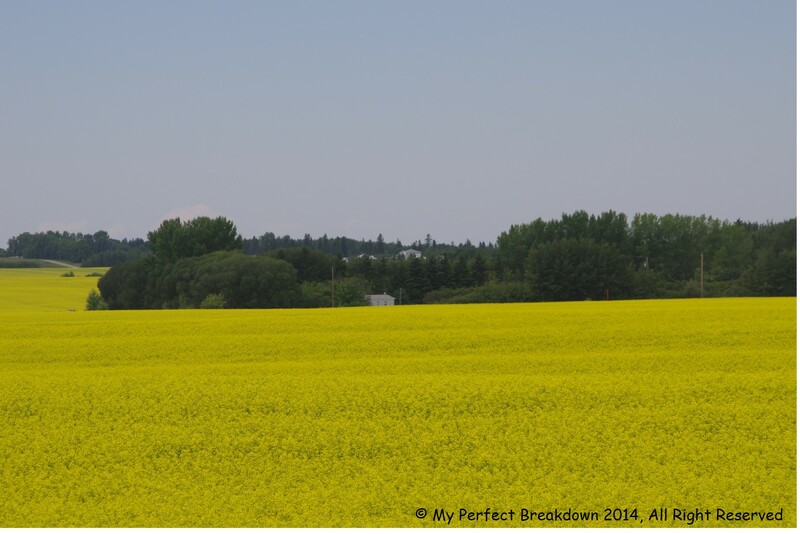 And, honestly, how can bright yellow canola fields in full bloom not make me happy? Day 18 – July 24, 2014: I tend to cook when I have inspiration, and since we cancelled cable TV and therefore gave up the cooking channel, I have virtually stopped cooking new and fun things. So, I decided I need some motivation in the kitchen and stopped by Chapters to peruse the cooking section. 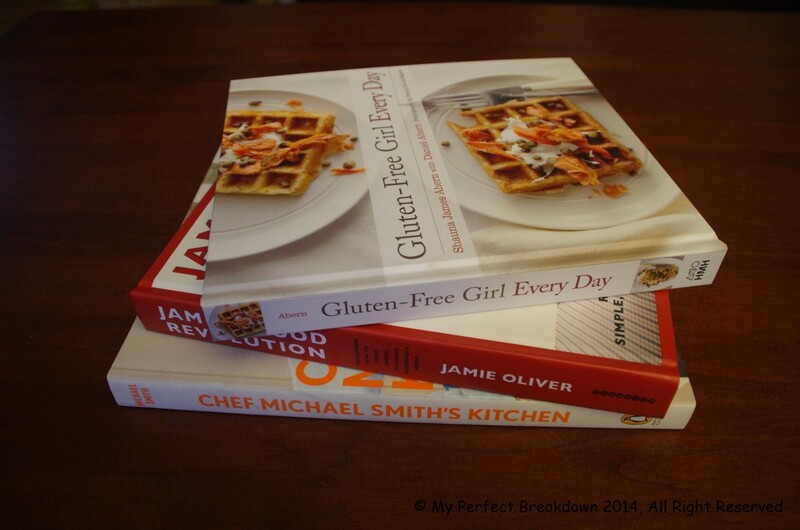 Now, my favourite TV chefs (and a recommended gluten-free cookbook) can provide me with old fashioned motivation through photography and the written word. Day 19 – July 25, 2014: In honor of a chill, relaxed day with my husband, I thought I’d take a picture of us happy together. (That said, if you have never tried taking a selfie of your hands with a large DSLR, it could be a frustrating exercise in ending a perfectly happy day – but I am happy to report that we survived and remained happy throughout the evening). Note, I have a french manicure – this is one of the only ones I’ve ever had in my entire life, and its held up for almost a whole week! This should be considered a double happy photo!! Day 20 – July 26, 2014: Today we went to the farmer’s market and an organic food store. While we were out we picked up some organic veggies and gluten free bread. 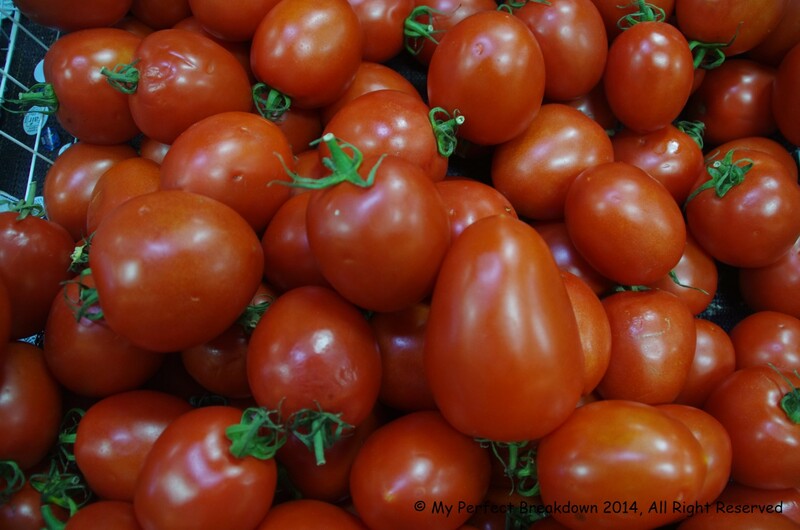 I couldn’t help but take a photo of all the roma tomatoes – one of our favourite summer vegetables. 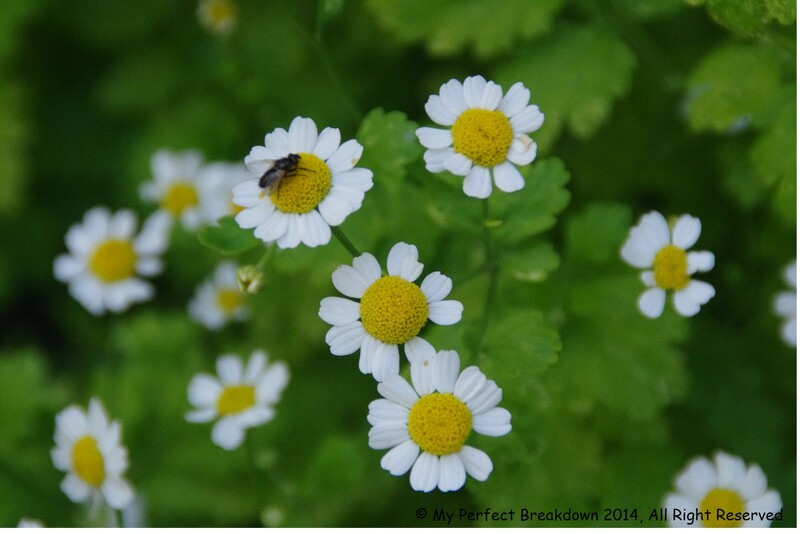 Day 21 – July 27, 2014: Today’s picture is happy for two reasons. First, it’s a bunch of flowers from a garden and flowers are happy. Note, that it is not form my garden, but my neighbours (those of you who know me, know my goal this summer is to keep my herbs alive, at present flowers remain outside of my gardening skill-set). Second, I remembered to take the photo! This photo was the result of a busy day without my camera and then me running around outside trying to get a photo when I realized that I didn’t have anything. As with all my happy day posts, I’m wishing everyone a great week filled with happy moments! I can totally respect the hand selfie with a DSLR. That’s pretty amazing. I’ve also never had a french manicure either! Good to know they last. Beautiful pictures. I love the bench one too. Thanks! I hope you are having a great day! 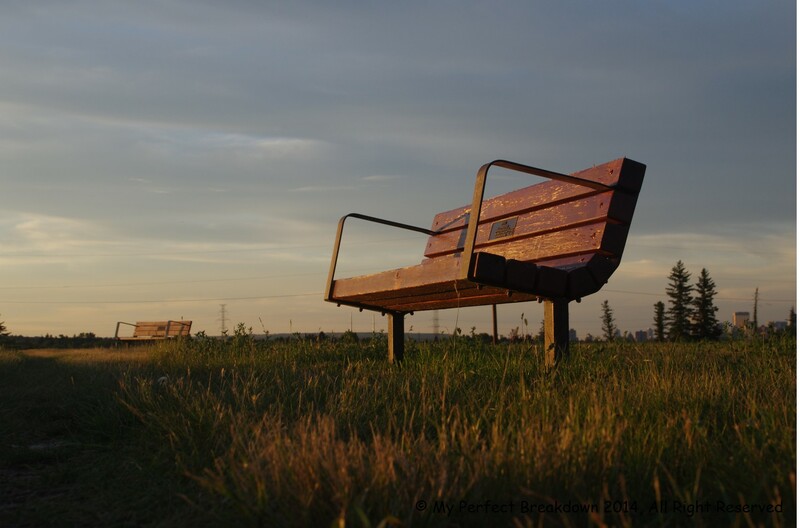 Ah man, I just want to sit on that bench and feel the calm! lovely photos and lovely moments of life! Keep it coming! Seriously, your photos are INCREDIBLE! So talented. And I’m so glad you picked up that cookbook. Shauna Ahern is awesome and we cook from it all the time. An earlier cookbook of hers is also amazing, but very much for special occasions. But it is a great story about how she met her husband – it made me cry a few times 🙂 I hope you love it as much as I do! First, thanks so much for the compliment! Second, thanks for the cookbook recommendation! I think the very first thing I’m going to make from the book is the waffles. Hopefully they turn out just as well as the picture makes them look!